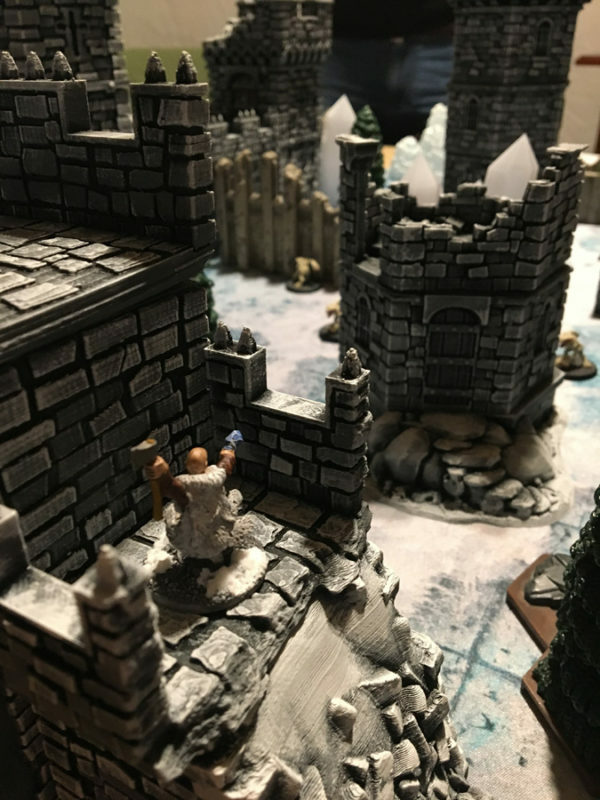 Our 3D printing team produced a massive amount of terrain that Colton painted up at the eleventh hour. 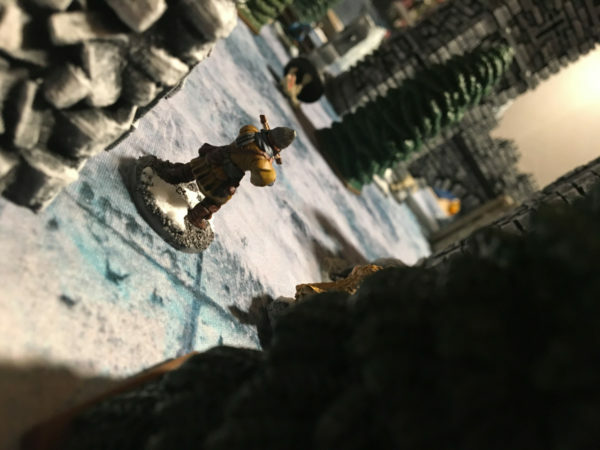 We sprinkled in some Heroscape tundra and forest terrain along with some AT-43 Frostbite scenery. Lastly, Colton also provided the great 3×3 gaming mat. 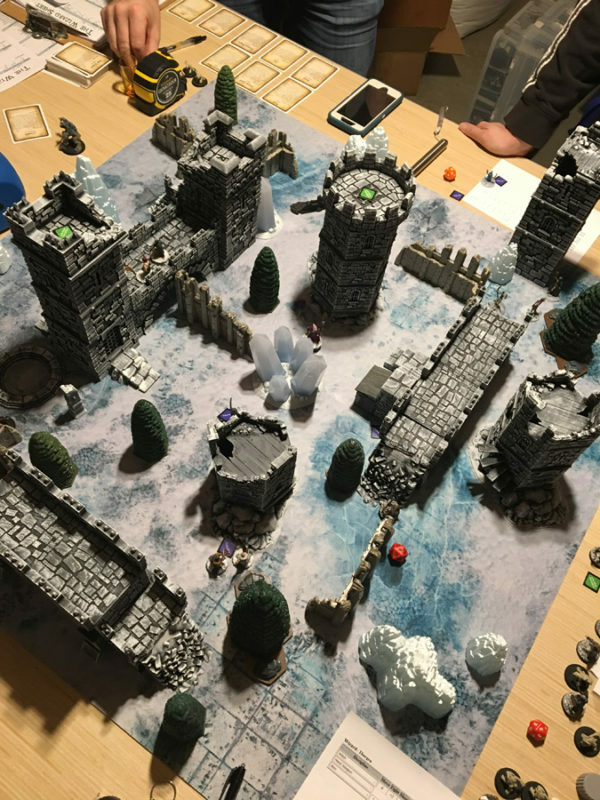 The scene(ry) was set so let’s look at the scenario we played. 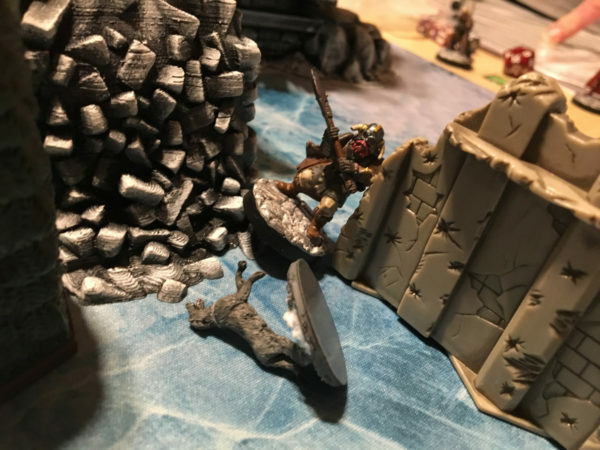 Rumors around town have been circulating about a particularly large treasure find that was discovered on the eastern side of Frostgrave. There have been rumors like this before and all have been found to be false or worse. Still, to miss out on such an opportunity is one you can ill afford. Sending your Apprentice and some hired hands to investigate, you’ll soon get to the bottom of this rumor and whether or not the drunks in town are finally worth the ale you forced down to hear their tale. Warband Construction: Your Warband may only consist of one Apprentice and four Soldiers. 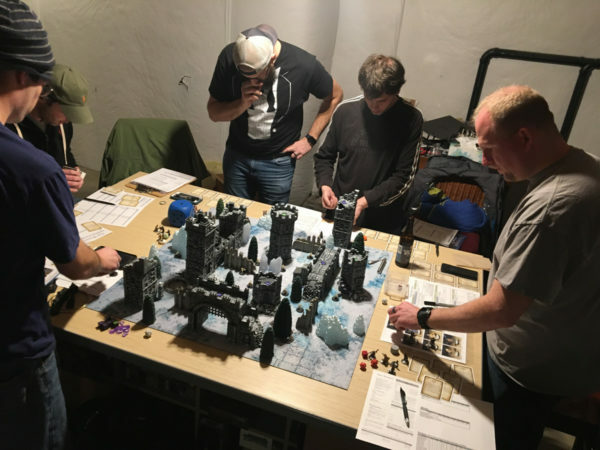 Setup: Use the standard map layout for generic scenarios. Instead of populating the map with treasure, place tokens of “intel” around the map (3 per player). Intel is treated like treasure in all ways except it does not hinder movement in any way. 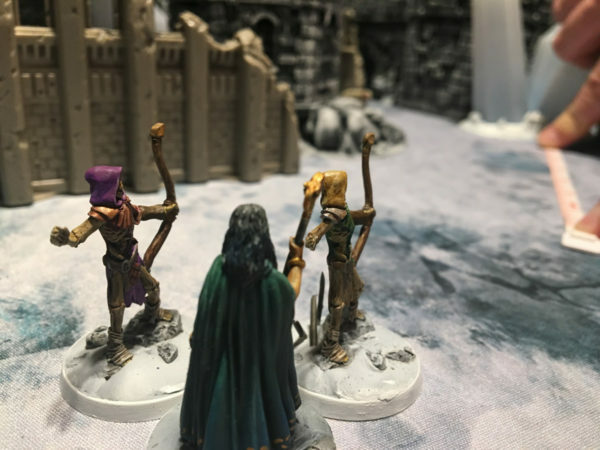 Players will activate their warband figures off the map and will need to move onto the map during their turn. 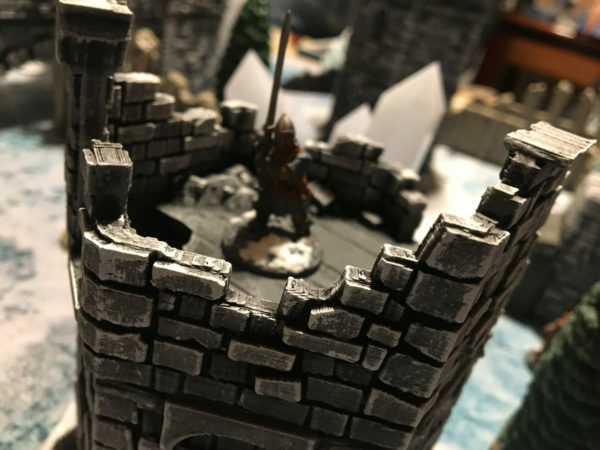 Players may not enter a side within 8″ of another player’s warband figure and Players must enter within 6″ of their own initial entry place. Players take turns placing up to 9 imps around the map (cannot be placed within 6″ of the map edge. 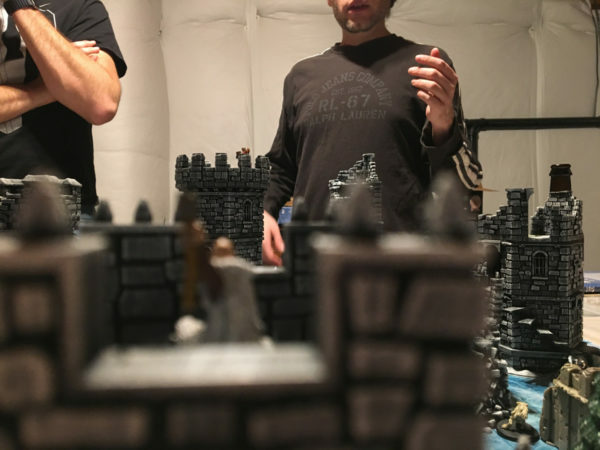 Place a minor demon in the center of the board or on a central scenery piece with the most intel around it. Special Rules: Starting in the 5th round, an evil darkness settles on the area. 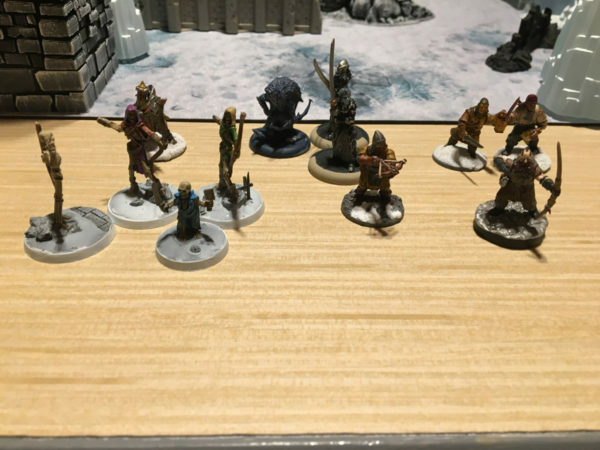 Line of sight is reduced to 8″ for all player figures and is unlimited for demons. At the start of a player figure’s activation, roll a d20. On a result of 20, nothing happens; 11-19, the figure takes 2 damage; 2-10, the figure takes 4 damage, and a result of 1 means the figure immediately dies and is removed from the game. Treasure and Experience: There is no treasure in this scenario, though intel collected will be used in future games. 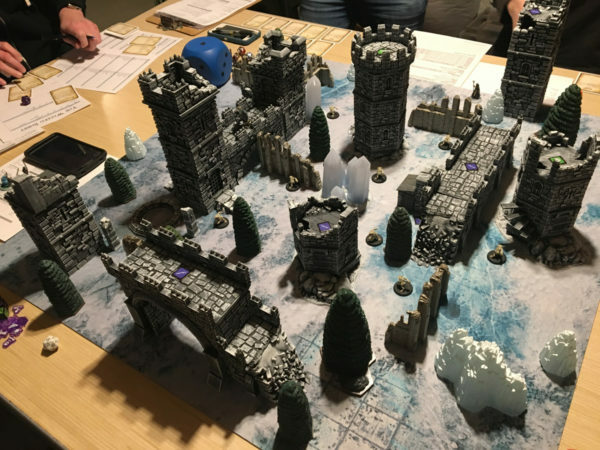 No experience is tracked in this scenario as it is an introduction to the game and rules before players solidify their warband and spell lists. 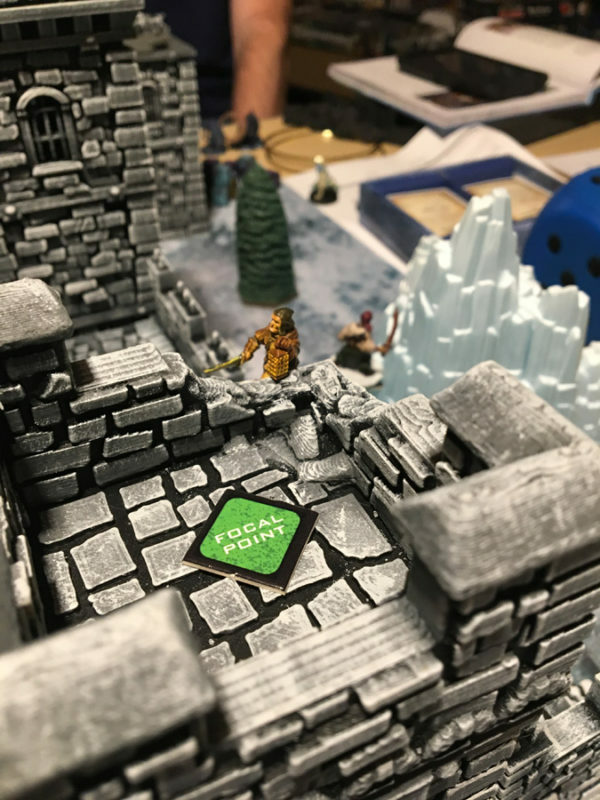 With the Scenario set up and ironed out, we merry band of wizards sent our hapless apprentices out to see what they were made of. 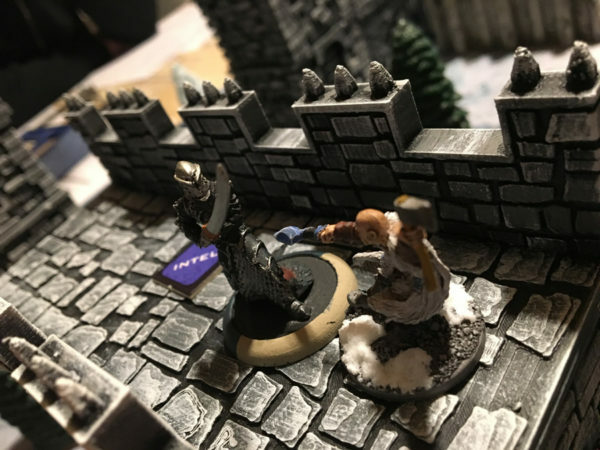 Colton won initiative and started moving his necromancer-in-training out with her skeletal soldier band. We are aiming for ultimate creativity in warband generation so Colton is making his soldiers mimic undead forces. We’re not sure if we want to fully engage it mechanically and give them the undead trait but we may homebrew things a little to help make things fit with the concept the player has in mind. On my turn, I sent Tog, my woodsman-witch out to scope out the high ground and nab an easy intel piece. Soon we hit our first casualty as one of Reese’s Treasure hunters took a critical hit from a wandering imp. I help to ruin Reese’s day further by poison darting his apprentice from across the map. 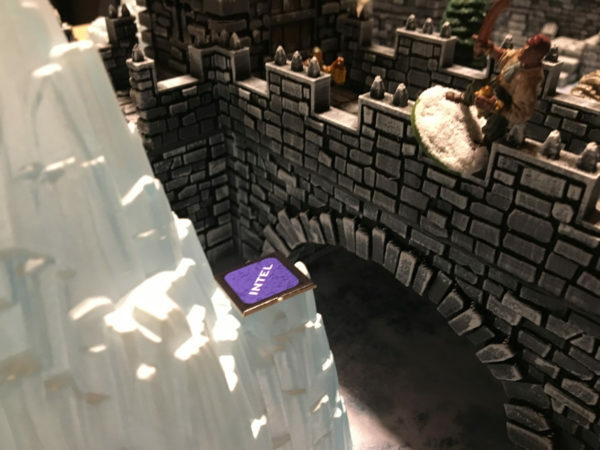 Though his apprentice made the bold move to teleport right to the top of the tallest spire, he will now need to burn turn after turn slowly getting the intel cache hidden up there. 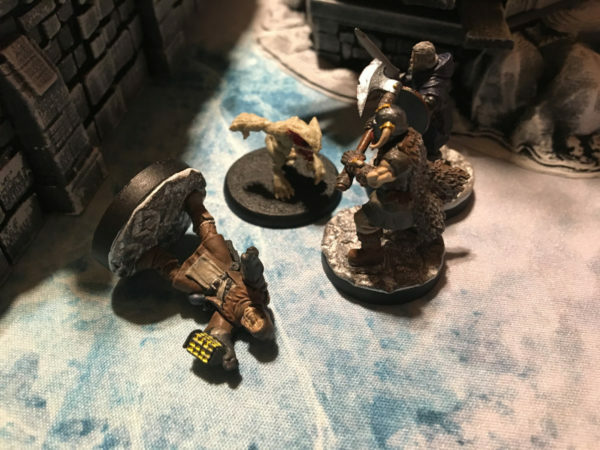 My Gil and my warhound, Claw, take down a nasty imp. While Osbert crits another imp around the corner. Unfortunately, Sean notices my apprentice, Tog, all alone and sends an infantryman up to say high. Distracted from my ensuing fight (that was going badly), Reese plots his revenge and has his apprentice bone dart my combat. He rolls abysmally and opts to power all his will into getting off the spell, mortally wounding him in the process. The spell is successful and hits the intended target (me) but deals no damage as my defense roll turns out to be too strong. Reese is not finished yet. He soon sends in his infantryman and kills Claw. My apprentice is finally able to pull away from Sean’s aggressor and yield the intel to his attacker. 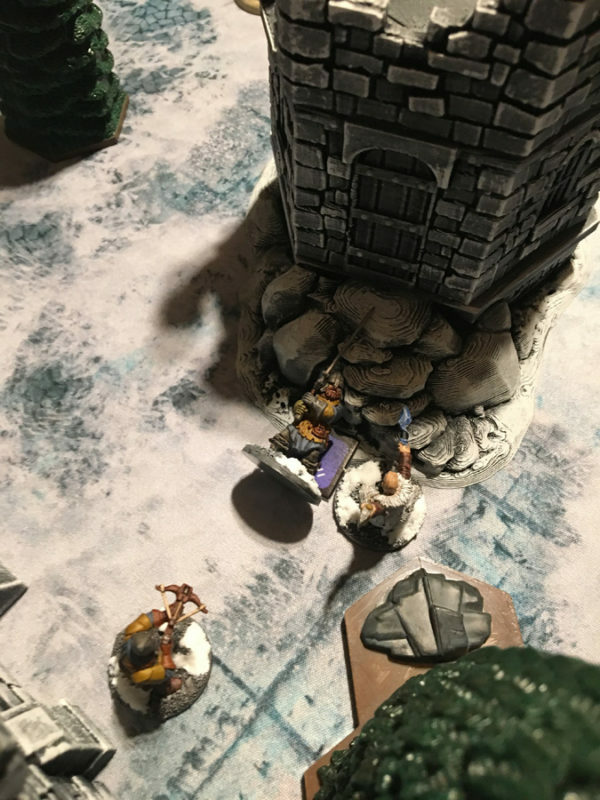 He flees down to a squat tower where a beleaguered infantryman, Osbert, is severely wounded but clutching a crucial piece of intel. Darkness is now approaching and he knows he won’t survive long after dark. 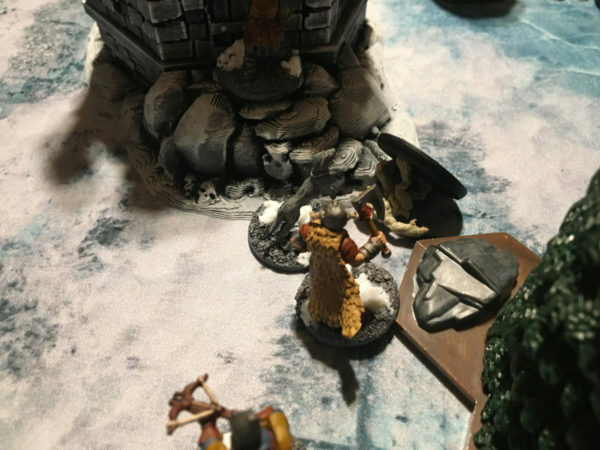 He makes the bold decision to jump off the tower and land in front of Tog, the apprentice, hoping that at least the intel survives and we can get the critical information we need back to Thurgen. It works, but Osbert’s death happens right in front of his brother, Osbert. The remaining Osbert picks up the vital intel and starts to make his way solemnly off the map. Full of bloodlust, my Treasure Hunter spies Jeremy’s Apprenice alone and unguarded. Having seen what even a simple infantryman can do to lock down an apprentice, Gil charges in and gets thoroughly walloped for his efforts. How disappointing. And humiliating. 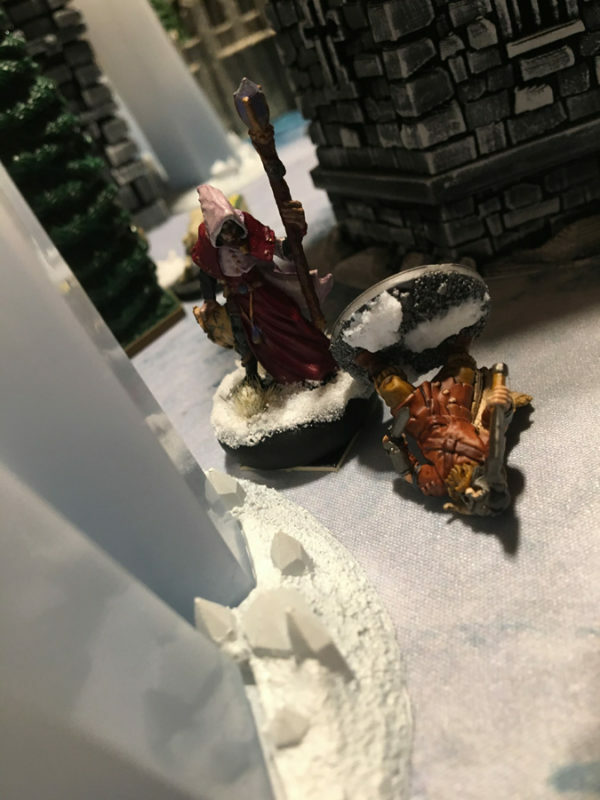 With most of the field dying or dead, my warband heads off the map. Tog isn’t fast enough (or smart enough to cast leap on himself to get out faster) and the darkness overwhelms him. Osbert soldiers on, however, and gets the intel out and safely home. Robert and Jeremy are soon the only ones with men still about and they stubbornly stay through the rampaging darkness to try desperately to take with them whatever intel they can hold. Some of their heroics work but in the end, everyone ended up losing their apprentice and most of their band. 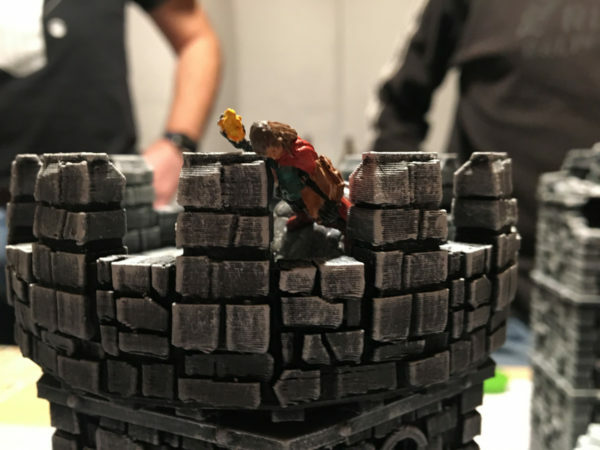 Of the thirty figures that started in the game, only twelve remained able to get to safety. We did slaughter all nine imps and the minor demon as well. In the end, it was a great game that introduced the main rules to everyone and let all six of us interact and hang out in one fun game. The game itself went about 3 hours, which was longer than expected but not bad for cramming all six of us into one 3×3 map. Everyone seemed charged and excited to step more into this game so we’ll be setting up the full campaign soon. Everyone will have a chance to build their full warband and solidify their Wizard discipline and spell list so that we can start in earnest. We won’t be playing epic games with every player, but instead, we’ll break off into smaller games to make sure they don’t run overly long. I was very happy to see that the magic of my Gen Con encounter didn’t fade and I’m excited to see where our campaign can take us.